"To fail is to learn and to succeed after failing is more gratifying then succeeding of the very first attempt." In Greek mythology Gaia is the ancestral Mother of Life; the primal Mother Earth Goddess. She’s a pure and captivate inspiration to my life. She has no colour, no hidden agendas, she has no politics nor religion, she speaks a universal language that every race, country and people of all ages can speak and understand. She has been a guardian to all humanity for four and a half billion years. My collection is a reminder to be kind to ourselves and to Gaia; Mother Nature. Her innocence and healing powers keep our planet healthy and spinning, yet we live our day to day lives in today’s fast pace society totally oblivious of the abuse we have caused her. We need to consciously be aware of the constant pollution and harm, caused by our carelessness or lack of education, to keep a healthy environment for the sake of every living thing, including ourselves. We as a collective need to unite to maintain a sustainable way of living to keep her healthy, to ensure her well-being, and to a secure a thriving environment for generations to come. “Gender is not something that one is, it is something one does, an act... a “doing” rather than a “being”. There is no gender identity behind the expressions of gender; that identity is performatively constituted by the very “expressions” that are said to be its results.” “We act as if that being of a man or that being of a woman is actually an internal reality or something that is simply true about us, a fact about us, but actually it’s a phenomenon that is being produced all the time and reproduced all the time, so to say gender is performative is to say that nobody really is a gender from the start”. The hairstyles not only reflect the androgynous lifestyle of the creator, but are also reminiscent of the lifestyle of many of her models – thus extending this exploration of gender performativity beyond an aesthetic decision, and into the real world. The concept for this collection was to focus on raw, natural texture, beauty, and threading the fine line of unkempt. We depicted a series of stunning woodland creatures, each with their own style, whose exterior beauty rivalled no other. However, growing up in the woodlands has its issues; without access to power and being isolated from today's world, these beautiful creatures tend to their appearances without the poison of societies norms, and the advantages of heat styling. In this collection, you will find our team’s artistic vision of what beauty would look like without the restriction of trend, the limitations of smooth, and the use of power. Enjoy as each image encapsulates how the woodland deity’s personality affects their portrayal of outward beauty. Humility; a word which is greatly forgotten when the world needs it most, my collection was based upon a Japanese tradition called Oho Harahe which is one of the most important and sacred ceremonies of the Shinto religion. It occurs every 30 days of the sixth and 12th month of the year and its purpose is to purify and cleanse body, mind and soul from pollution, sins and calamities. I believe that this is relevant to not only the world now but can be applied to both your personal and professional lives as well. I chose to use 4 figures representing all classes from histories social hierarchy which are the Geisha (Artesian), a Peasant (Lower Class Citizen), a Samurai (Government official [Middle Class Citizen]) and an Empress (Royalty [First Class Citizen]). I did this to show that no one is above faith and humanity, to reiterate that everyone sins at some point and that it is important to reflect on our past and to forgive ourselves for what we have done wrong. A transition from traditional vibrant colours to create something that is inspired by autumn/winter tones, subdued and muted. The notion of beauty frozen in time led to the fusion of primitive styles captured upon a backdrop of icicle, frozen and thawed elements! It is provocative and androgynous, raw and dramatic, and has a modern interpretation of nomadic and primitive feel. The inspiration encompass technical skills in styling, showcasing the use of different textures, whilst marrying the collection with modern art inspired water colours. Studying different sub cultural trends, the looks create a compilation of looks that best reflected the direction of present day hair fashion with a future fashion forecast. The use of water colours as the subliminal sub context served as the editing technique that unified the collection, hence the collections title ‘Aquarel’, an adaptation of the word meaning Watercolour, in French. Each image showcases a different skill set and texture. 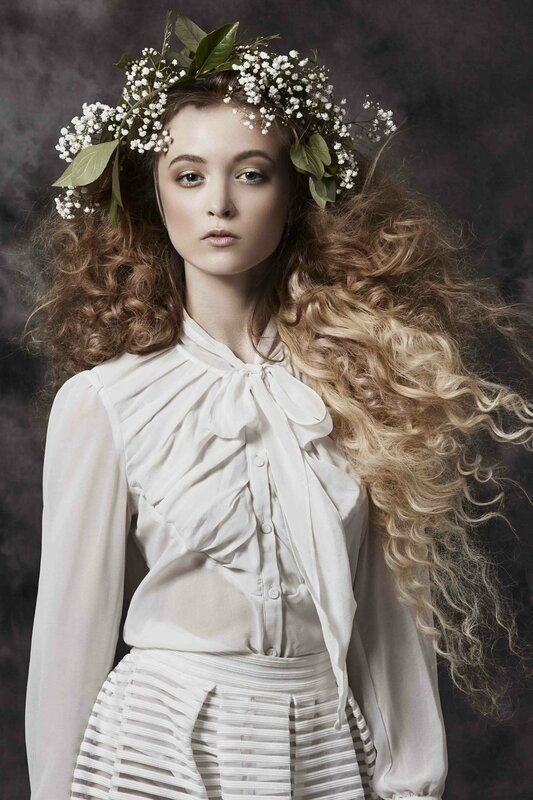 Using a combination of technique, heat styling and natural texture enabled the creation of six future hair fashion forecasts. Tough yet pretty; Gritt, Inspired by current trends that harness a tougher approach to hair and styling. Combining the evolution of retro’s influence on hair as it transitions into a more 1980’s aesthetic, with the roughness and untamed nature of more organic silhouettes and a love for sport luxe, The aspiration was to create a collection that is an eclectic meeting of ideas. Expressing these diverse concepts through jaggedly cut and layered styles, such as the mullets and bobs, juxtaposed against messy curls and hard edge grunge inspired detailing. that generates a cosmic ray of endless fluctuation of multi-dimensional vibrancy and shades. In the cosmos, the meaning of natural is suppressed but the artificial colors are the dominant forces as bright hues would fuse or collide with each other to create instability of unspoken beauty. The external perimeter of the galaxy is distressing, mysterious and unforgiving as it is filled with dark energy and can be expressed through the emotions of these shadowed particles. Their forms have been completely shattered by the empty space and can be seen within their inability to be pure anymore. A vision of the future of hair color. Inspired by the necessary movement that repels from artificial and manufactured, and instead focuses on our natural biodiversity. 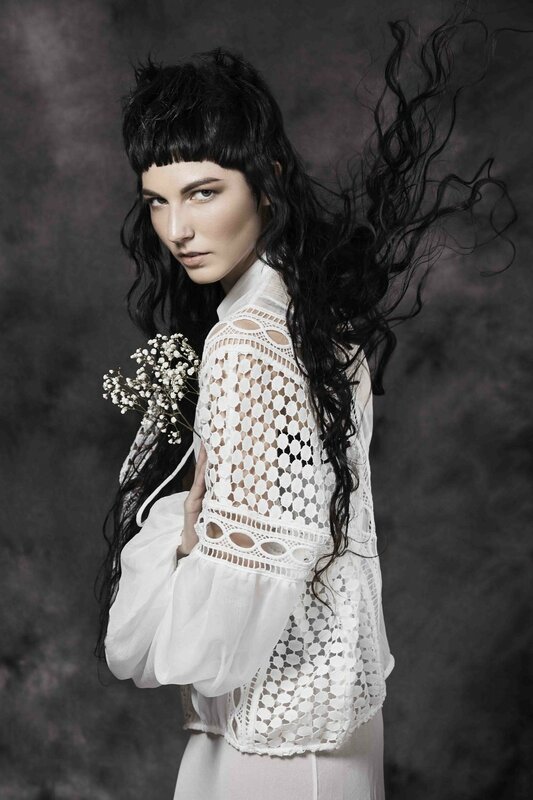 The collection focuses on recreating feathered-like textures, floral palettes and abnormal patterns found in our own biological surroundings, and embodies this into the hair direction. A world of beauty where flora and fauna coincide as a symbiosis, which evolves together and adapt to seasonal changes. Envision a utopian earth, unravaged by man. Birds dominate the skies, plants and trees are overgrown and lush. Our collection emulates that of these natural textures, of wind blown feathers from birds soaring through the air, of grassy overgrown plains drifting with the wind. My collection aims to draw you to a seamless movement of windswept textures. The pallete is derived from the diversity of all things nature. The aim was to convey my darker tones with reference to earth, volcanic ash and onyx as a base to landscape my lighter, more vibrant floral, animal and aviary formations. For each photograph, a specific color scheme was selected, with the aim to draw the viewer into a vista of vibrant hues that can be found in our very own flora, fauna and geological treasures. The focus and vision for my colour collection is to be bold, by enhancing the complexity of the haircut, and forcing the observer to look at the designed focal points. By bleeding and patterning the tones, we encourage the observer to initially draw attention to the brighter tones, before noting the complexities of the darker framing and subsequent disconnections, with the ultimate goal of creating a fusion of natural expression and animal characteristics, where wind swept textures influence angles. The inspiration of avian texture and the contradicting vibrant/earthy tones represent the unity of flora and fauna coexisting in symbiosis.